A letterhead template of this caliber is meant to make any type of wedding business shine. It doesn’t matter if it is a wedding planning business, a wedding cake business, a wedding dress shop, or a wedding favors online ordering website. This Red Theme Letterhead Template gives any wedding business a look of color with lots of dare, passion, and all things good from the get go. 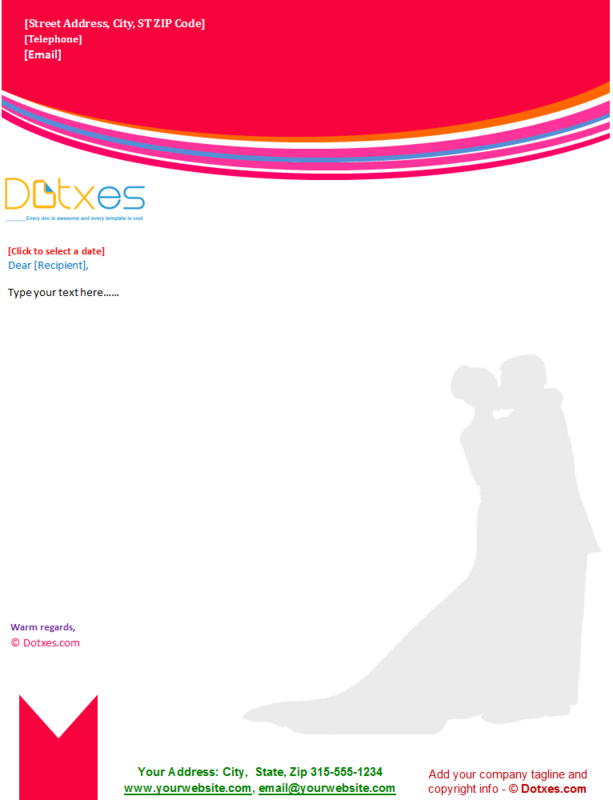 This wedding letterhead can also be personally customized from the fonts to the colors right down to the text itself. What can you use this specific letterhead template for the best? It can be used to send out personal letters of thanks to customers who have done business with you. It can be used to send out marketing letters to promote your specific wedding business in particular. It can be utilized as a personal business letterhead to send to other vendors. It can be used to write a personal letter from an executive of a wedding business to an employee or fellow executive within same wedding company.